Punti Necessari: 2950 Please note that, for now, you cannot download content from our platform directly onto a mobile device (phone, iPod, iPad, tablets...). You need to download your items onto a PC or Mac, and then transfer them onto your device in the normal way. We are working on allowing direct downloads to mobile devices but this is not possible in the current version of the platform. Sorry about the inconvenience! NOTICE: Requires the base game Batman™: Arkham Origins in order to play. Activation key must be used on a valid Steam account, requires internet connection. 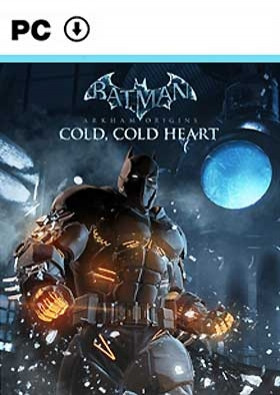 If you own the Batman™: Arkham Origins Season Pass, DO NOT purchase this content here as you will be charged again. ABOUT THE GAME	Return to Gotham City to ring in the New Year, Arkham Origins style. When the CEO of GothCorp is kidnappe… d, by Mr. Freeze, Batman™ sets out to bring him to justice. Along the way, he will uncover the tragic history of his new enemy, prompting our hero to attempt the impossible: save the victim AND the villain. Hours of narrative-driven gameplay and new Open World content await!SYSTEM REQUIREMENTS Minimum OS:32-bit: Vista, Win 7, Win 8 Processor: Intel Core 2 Duo, 2.4 GHz / AMD Athlon X2, 2.8 GHz Memory: 2 GB RAM Graphics: NVIDIA GeForce 8800 GTS / AMD Radeon HD 3850 or better with 512 MB of VRAM DirectX®: 9.0c Hard Drive Space: 20 GB Other Requirements: Broadband Internet connection Additional Notes: Windows XP and DirectX® 9.0b and below not supported BATMAN™: ARKHAM ORIGINS software © 2013 Warner Bros. Entertainment Inc. Developed by WB Games Montréal and Splash Damage. Batman™ and all characters, their distinctive likenesses, and related elements are trademarks of DC Comics, © 2013. All Rights Reserved.WB GAMES LOGO, WB SHIELD: ™ & © Warner Bros. Entertainment Inc.